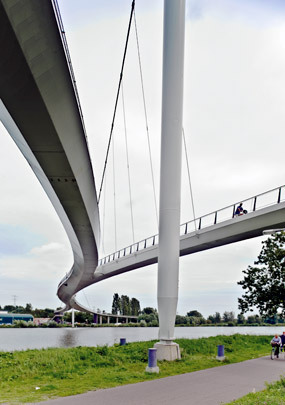 Like the bridge for motorized traffic (Enneüs Heermabrug) this one for cyclists and pedestrians was designed as an unmistakable landmark for the new district of IJburg. At 176 metres long, it crosses the Amsterdam Rhine-Canal at an angle to avoid a monumental house on the west bank and the yacht harbour on the other. The required clearance height is 9.3 metres. A total length of 750 metres is to keep the steepness of the approach ramps for cyclists within limits. The bridge and its attractively curving ramps form a single flowing movement. To stress this, its designers opted for a suspension bridge with the deck slung between two masts. The deck literally splits into a footway 1.5 metres wide and a 3.5-metre-wide cycleway. This physical division generates a triangle that contributes to the deck's overall stiffness.